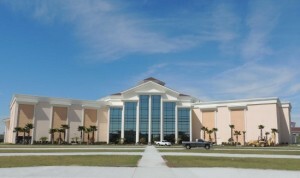 The new campus of Orlando’s Faith Assembly of God Church was a huge project. In addition to the 3,000-seat, stadium-style sanctuary, the campus also needed sound systems for three kids theaters, a wedding chapel, choir room, and atrium. 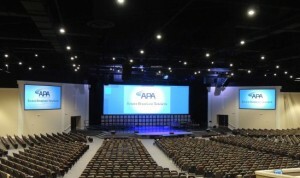 Primary AV contractor Encore Broadcast Solutions decided to leave nothing to chance, partnering with Atlantic Professional Audio (APA) as audio sub-contractor for the design and installation. “Even though it was new construction, we were actually the second contractor on the job, so we had to design the sound system around conduit and fly points that were already in place,” explains Jeff Cameron of Encore’s Winter Springs, FL office. “It was a big challenge." The speaker hangs consist of two six-speaker Turbosound Flex arrays, augmented by a pair of four-box delay arrays. 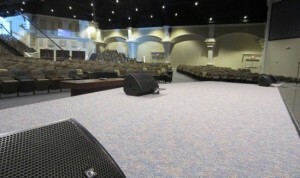 All the sanctuary arrays consist of Turbosound TCS-1061 three-way loudspeakers, with the 75-degree dispersion version occupying the bottom two slots in each array, and 100-degree models above them. The TCS-1061 is switchable between bi-amp and tri-amp deployment, and houses two 10-inch low-mid drivers, one 6.5-inch high-mid, and a one-inch high frequency compression driver on a Dendritic horn. Frontfill duties are handled by Turbosound’s NuQ line, with a pair of biamped NuQ-8s flanked by four more passive NuQ-6 boxes to ensure solid yet unobtrusive coverage for the front rows. Sidefills came from Turbosound’s Aspect line, with one TA-500 and TA-500HM flown alongside the Flex arrays to provide full-range coverage for the side seating areas. A total of 17 Turbosound RACKDP-50 amplifiers are networked to power and control the sanctuary sound system, using the BV-Net-USB to optimize performance of all individual components as a cohesive whole. The sound signature is completed by Turbosound subwoofers, with a pair of TSW-218 subs housed under the stage, complemented by nine TFA-600L units flown above. APA’s Vice President of Integration, Michael Ramey, oversaw the integration. A good example is the choir room, which functions as a rehearsal and meeting space for Faith Assembly’s 75-member choir. To accomplish that, Ramey specified a self-powered system consisting of two wall-mounted NuQ-12DP mains, augmented by a pair of B15DP subwoofers. Various Turbosound NuQ speakers were also employed in the three kids theater rooms and the wedding chapel. The two larger kids’ theaters accommodate up to 300 youths, with staging designed for video and theatrical presentations. Three NuQ-10 speakers comprise the mains in a left/center/right deployment, augmented by a pair of TCS-B15A subwoofers. Two TCX-8 compact two-way speakers handle stage monitoring. All seven speakers are flown to keep the stage area clear. The third kids’ theater is for early elementary age children and is classroom-sized, with all sound reinforcement handled by a pair of ceiling-mounted NuQ-8 full-range loudspeakers. The wedding chapel is an intimate space designed for acoustic music and voice, obtaining full, rich sound from a pair of NuQ-12 speakers supported by two B-15 subwoofers. Like the sanctuary, choir room and kids theater spaces, all speakers utilize the RACKDP-50 power management system. The sole exception is the church atrium, where sound reinforcement is supplied by a pair of self-powered Turbosound TXP-121 loudspeakers. In terms of customer satisfaction, Jeff Cameron of Encore Broadcast Solutions feels that the switch to Turbosound proved to be a critical piece of the Faith Assembly installation.